Here are some test prints with objects downloaded from thingiverse. 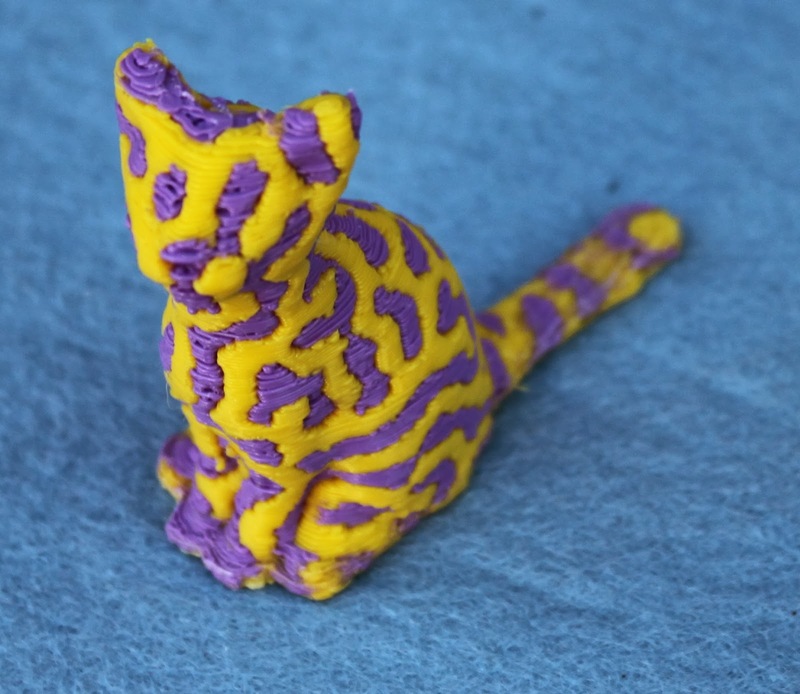 The printer is also a remix on thingiverse. 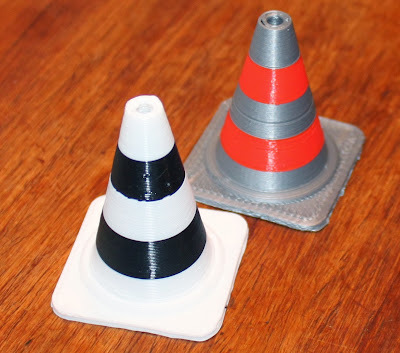 As can be seen there are still some issues with ooze - pretty much like all dual extrusion systems out there but I have managed to counteract a lot of it by building a skirt all the way up the object and cooling the inactive nozzle. The hot ends are the RepRapPro design, specifically meant for 1.75mm bowden systems and well proven on their printers. 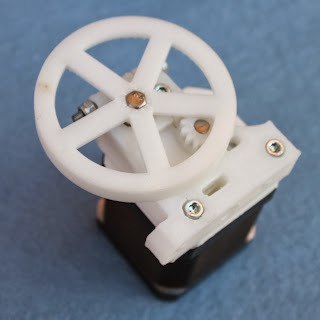 I have also used RepRapPro mini extruders which are nice and compact with the inner gear mechanism. The only changes I have made in the extrusion system as a whole is the bowden tube is more than twice as long to accommodate the difference in extruder mounting position and printer height. The main change to the Lasercut Mendel90 itself is a modified X carriage to mount the hot ends, including a mount for the breakout circuit board. The OpenSCAD render below shows the main components including the locations for the hot ends (in transparent grey). Although the carriage belt attachment points have been moved slightly closer together the same length of belt will still fit. 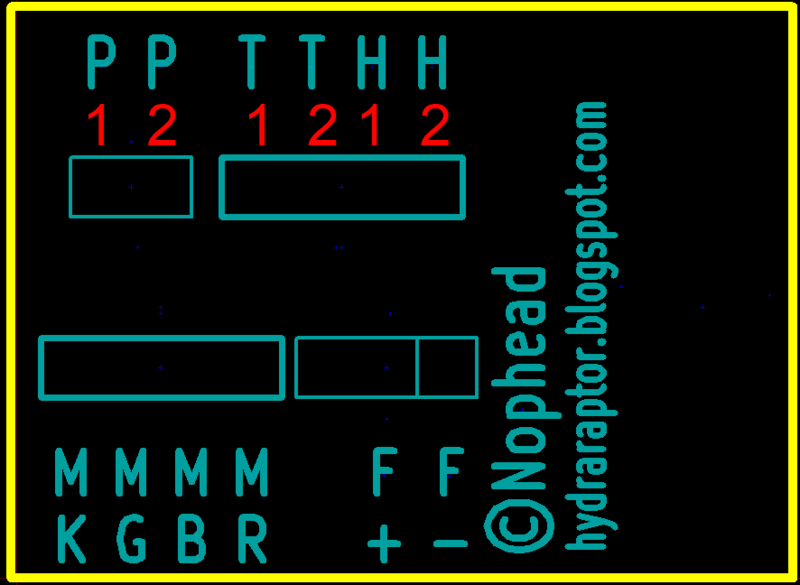 The new printed parts required are shown below: the belt fixings, bearings and breakout PCB can all be reused. The fan mount is very simple and not particularly effective - it uses a 40mm fan which only blows in the general area of the object being extruded. I have forked the Lasercut Mendel90 code on Github as "dual" and uploaded the changes (the stls that have "RRPE" in their files names. The Lasercut Mendel90 kits use 26 AWG ribbon cable, rather than 28 AWG, which means the cabling can carry a higher current and is more than capable of the additional requirements of a hot end rather than a motor. As there are already ground and +12V connections on the PCB the extruder cooling fans which are "always on" can be wired in, sharing the screw terminal spaces with the thermistor GND and hotend +12V. 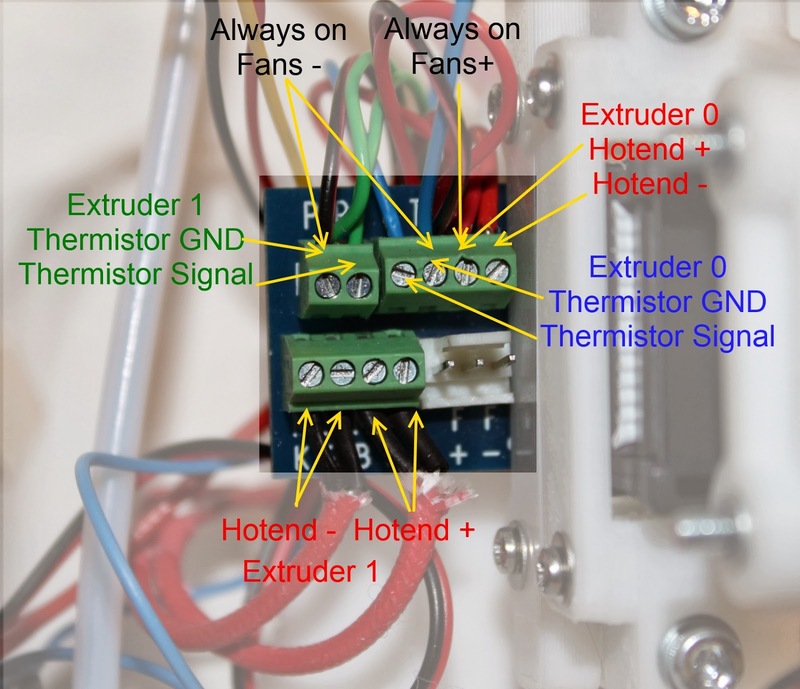 I was initially concerned that this arrangement might add significant noise to the thermistor circuits and degrade performance but I have noticed no adverse effects. At the RAMPS end I took the software controlled fan cable from D9, put a plug on it and plugged it into T1 on the Panelolu2 adapter board. In addition the previously unconnected "probe" cable (wire 5 in the ribbon cable) has a plug put on it and then plugged into pin 6 on the T0-T1-T2 6 pin strip. The firmware needs to be changed to use dual extruders on RAMPS (set "#define MOTHERBOARD 34" in Configuration.h and "#define EXTRUDERS 2" in Configuration_adv.h. 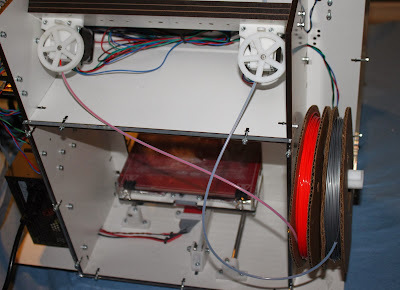 I have also used some PTFE tubing as filament guides from the spools to the mini extruders. As this is still a work in progress I will not go into the fine detail of how to do it but hopefully this summary and the pictures will set anyone who wants to give it a go on the right track. Print the parts for the X carriage and RepRapPro mini extruder. 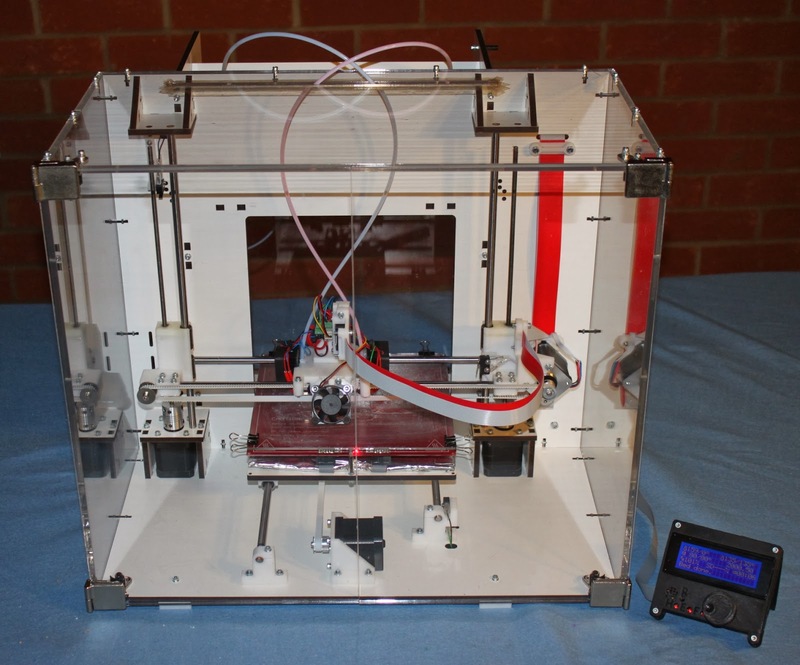 Get hold of the vitamins needed for the mini extruders. Change the existing X carriage and extruder for the new x carriage. The fixings, belt and PCB can be re-used, and the E motor can be re-used on one of the mini extruders. Wire it up according to the wiring information above. RepRapPro has a good tutorial on slicing multi material files and setting the extruder heights and offsets, although I simply used a single walled cube, added twice to a multi material file and adjusted the offset until both walls printed on top of one another in X and Y. A better fan bracket that focuses the air on the extruded part, like the original Mendel90 one. Improve the tool change gcode I use in Slic3r and tune the hot ends' PID, ooze temperature, etc to improve print quality and reduce print time. 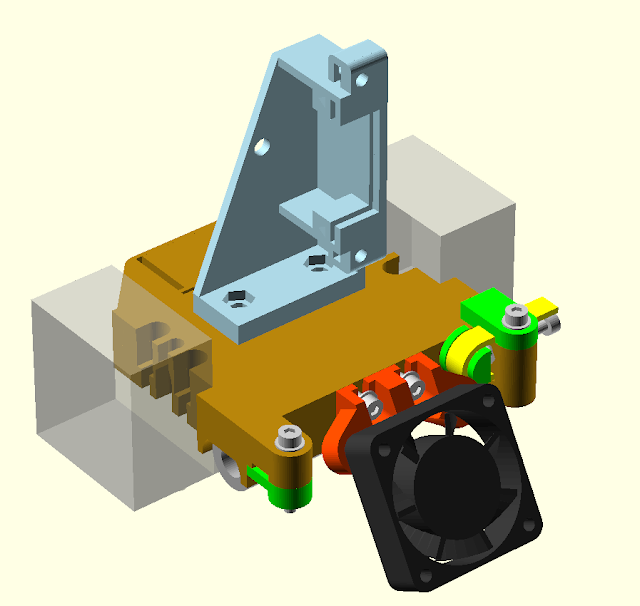 4 or 5 extruder carriage design - I will probably common the "cold" part of the hotend to reduce the number of fans and get the nozzles closer together. 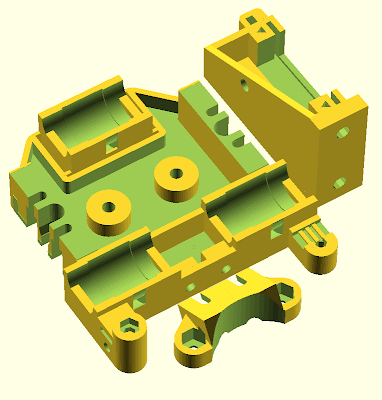 New cabling plan for a 4 or 5 extruder setup. Demonstrate the new electronics - more to follow on this in a couple of weeks. 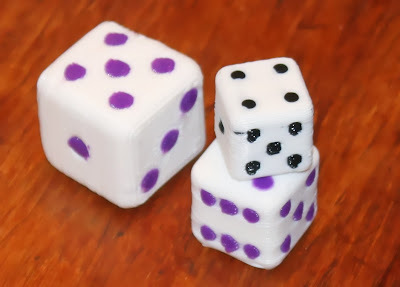 Design some 4 or 5 colour objects. 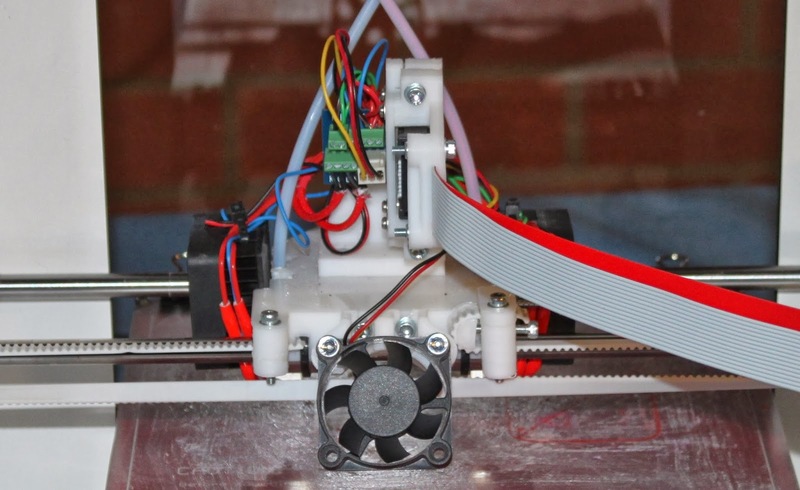 Ask RichRap for his "ultra easy dual mixer hotend" design! All this will take some time so don't hold your breath! If you are just starting with 3D printing, or looking to make largely functional objects then I recommend staying with a single extruder system such as that on the standard Lasercut Mendel90.